lumbar puncture nothing to fear! I was touched when someone send me a message asking about a procedure called lumbar puncture. The person was concerned because someone she knew had just taken their child from hospital against medical advice. The reason was that the parents were afraid that their child would die from the procedure. I was surprised to hear that there are people who think that lumbar puncture is dangerous and results in death of patients. May I take this opportunity to explain this procedure and hopefully convince one or two people not to run away from health professionals each time a lumbar puncture is suggested. I can sympathise with these parents as they do not mean harm to their children but in their actions they may end up losing that child due to the worsening of infection. Health professionals do not request a lumbar puncture randomly without a reason however it seems at times not enough time is given to educate patients on the benefits of the test. We must remember that this test is done in patients who are seriously ill and their survival depends on the speed with which medical intervention is started. If there is severe infection such as sepsis ( infection of the blood) any delay in starting treatment will increase the risk of that patient dying. 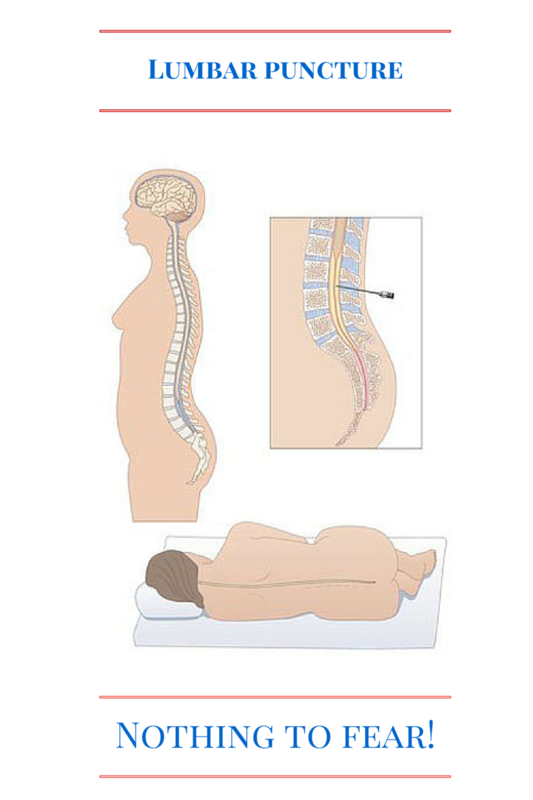 A lumbar puncture (also called a spinal tap) is a procedure to collect and look at the fluid (cerebrospinal fluid, or CSF) surrounding the brain and spinal cord. 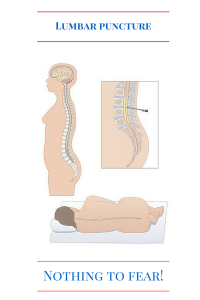 During a lumbar puncture, a needle is carefully inserted into the lower part of the spine to test for conditions affecting the brain, spinal cord or other parts of the nervous system. During the procedure, pressure is measured and samples of cerebrospinal fluid (CSF) are taken from inside the spine. CSF is a clear, colourless fluid that surrounds and supports the brain and spinal cord. Analysis of CFS can often reveal a good deal about some conditions that affect the brain and spinal cord. Meningitis – an infection of the layers (membranes) surrounding the brain and spinal cord . This is a serious infection that must be treated without any delay. Guillain-Barre syndrome – a rare condition that causes inflammation of the nerves in the arms and legs. A lumbar puncture doesn’t necessarily mean you have one of these conditions; it may be used to rule them out. A lumbar puncture can be used to treat some conditions , such as injecting antibiotics or chemotherapy medication into the CSF. How is a lumbar puncture carried out? Under local anaesthetic or without it ,a hollow needle is inserted into the base of the spine and into the spinal canal, which contains the spinal cord and the nerves coming from it. The pressure within the spinal canal is usually measured and some CSF is removed either to reduce the pressure or for a sample to be sent for testing. Patients will normally be lying on their side, with their legs pulled up and chin tucked in, but sometimes the procedure is carried out while they are seated and leaning forwards. It usually takes around 30-45 minutes or less to complete. Results on CSF samples can be available within 48 hours, but specialised tests can take several weeks. A lumbar puncture is generally safe and the risk of serious complications is very low. Serious side effects are generally uncommon, although many people experience headaches caused by CSF leaking out through the needle hole in the spine. This occurs internally, so you won’t see it. The headaches are typically worse when in the upright position and can usually be relieved by lying down. Drinking plenty of fluids and taking simple painkillers will also help. It can take up to a week for the hole to heal and the fluid to stop leaking. Sadly the infection being investigated may result in the death of the patient if it is not treated properly or treatment was delayed. My advice to the readers of this article is that lumbar puncture is a safe test and we should allow the doctors to explain the procedure to us and let them carry out the test. Feel free to ask your doctor any questions that you may have rather that taking your child away from hospital. I would like to hear your experiences and may you also share with your friends this article so that it reaches to those in desperate need of this advice.